Once you’ve taken the protective wrap off of your new tattoo (which your artist should have applied before you left the studio), you should be able to shower whenever you feel you’re ready to, although some artist suggest you wait at least 24 hours before trying to shower. It’s always best to listen to your artist first-and-foremost, as they will always know your tattoo better than anyone else, and will therefore always be able to advise of the best possible aftercare routine for you personally. Although you’re able to shower soon after getting your new tattoo, there are a few rules that you should always follow (section below) to ensure that you don’t potentially ruin your tattoo in any way during the showering process. You must remember that your new tattoo is essentially an open wound and therefore needs to be treated with utmost care at all times during the healing process. 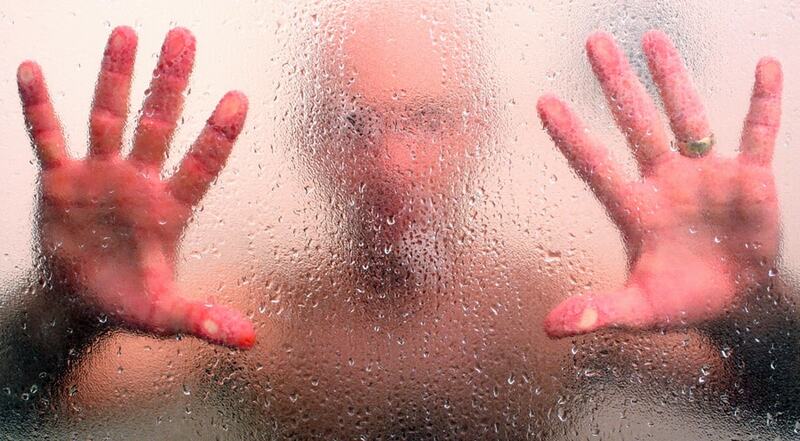 Turn on your shower and run the water until it is either cool or lukewarm. Always check the water with your hand before getting in. Do not get in a hot shower with a new tattoo. Your skin will be extremely sensitive and the hot water will cause pain and stinging to the area, as well as possibly causing the area to swell more than it already has done. Warm/hot water also has the ability of opening your skin pores up, which could lead to ink being lost, leading to a faded or patchy tattoo. For this same reason you will want to make sure that the shower isn’t set to blast water out too powerfully in case your tattoo comes into contact with the jetstream. The powerful water jets could cause you tattoo to sting and may possibly push ink out from the area. Very carefully dampen the tattooed area with the shower water. Never apply water directly onto the tattoo with the shower-head. 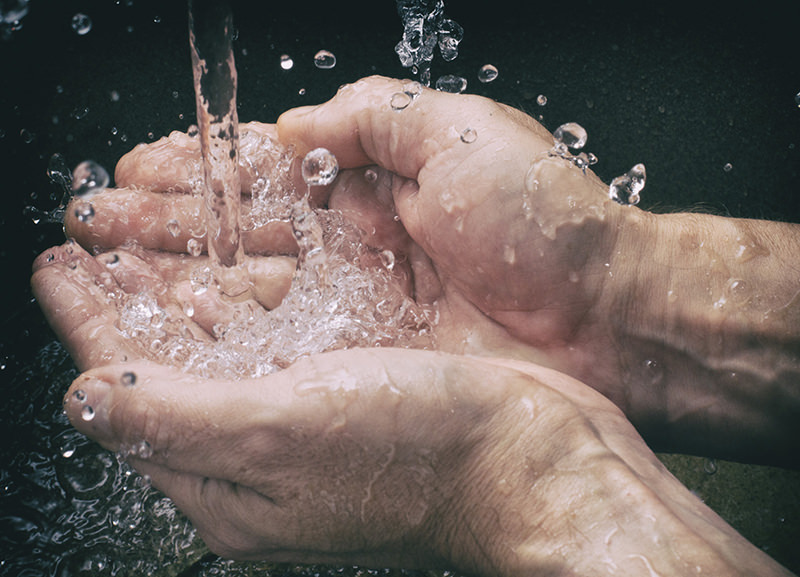 Instead, make sure that you cup the water with your hand and wet the area this way. This is less harsh on the sensitive skin and limits the possibility of the jets forcing ink from the area. Ensure that you have a skin-sensitive and fragrance free soap available to clean your tattoo with. Always check the ingredients to ensure that it doesn’t contain any harsh ingredients that are harmful to your skin such as alcohol or artificial fragrances. Proceed to very gently rub the soap over the tattooed area, ensuring that you rub off as much loose and excess blood, ink and plasma as possible. Once you are satisfied that the area is clean, cup water of the area again and make sure all soap has been washed away. Alternatively, you can clean your tattoo before you get into the shower, this way you can be more careful and attentive to the tattoo. We have a whole article showing how to properly clean a new tattoo. Once you have cleaned yourself and the tattoo, leave the shower as quickly as possible. You will want to keep showers as brief as possible so that your tattoo is exposed to steam, water and soap for as little time as possible. Any of these things in excess can lead to problems with your tattoo fading or becoming extra-sensitive. Too much water can saturate the area and may dilute/wash out the ink. Too much soap can dry out the area or draw out ink. Too much steam can open the pores of your skin and cause ink to draw out from the tattooed area. Be very careful not to dry the area with the towel you normally use to dry yourself after a shower. You are welcome to dry the rest of your body with this towel but either let the tattooed area air-dry naturally, or blot it dry with a paper towel. Remember that your tattoo is still an open wound and your regular towel is likely to contain many types of various germs and bacteria that are dangerous to your tattoo and can potentially cause an infection. Warning - Never scrub or rub your new tattoo. Always dry it by lightly and gently dabbing/blotting the area with a clean and non-abrasive paper towel. This ensures that you don’t accidentally pull away any scabs or pieces of peeling skin that are not yet ready to come off. This can lead to prolonged healing, scarring, fading and infection (due to the lack of scabs protecting the wound). 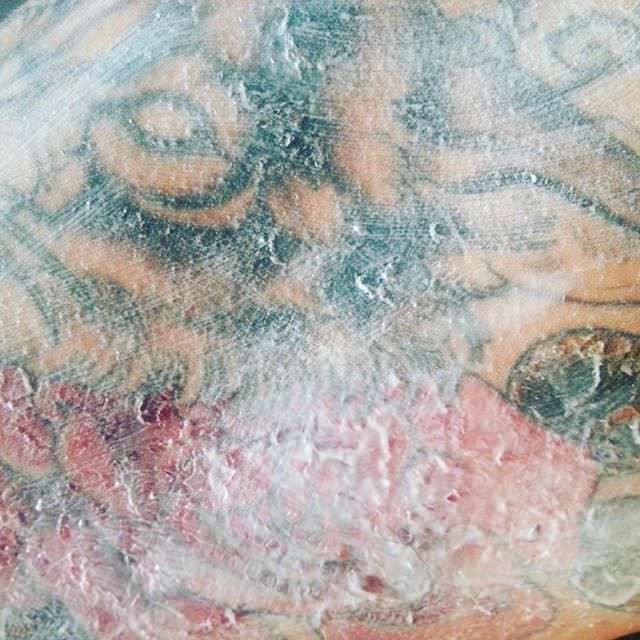 After your tattoo has completely dried, you will want to add a good quality tattoo lotion to the area to ensure that the area doesn't dry out too much. Tattoo lotions are also full of added vitamins and minerals to help speed up the healing process. Ensure that your hands are clean before applying any lotion and make sure that you only apply a very thin layer to the tattoo. A thick layer of lotion can suffocate the area and prolonged healing times. There are many various tattoo-specific lotions available which help to keep the area well hydrated and promote faster healing by containing quality organic ingredients. Hopefully you should now realise that showering with a new tattoo shouldn't be a difficult or painful process. 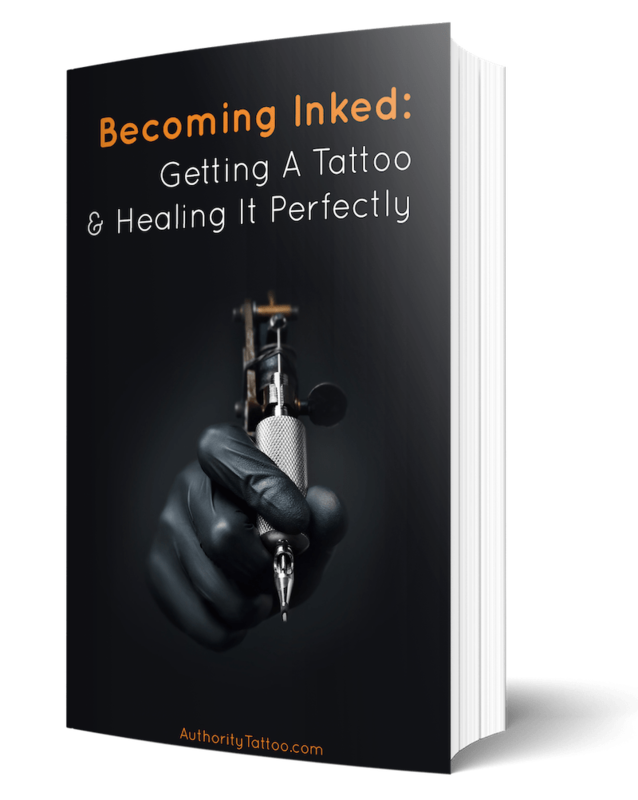 Just follow the steps above and ensure that you treat your new ink as well as you possibly can during the initial tattoo healing stages. After 2-3 weeks once your tattoo has finished scabbing and peeling, you should be able to go back to your usual showering routine and start showing off your perfect and wonderfully-healed new tattoo.